Perennial peanut is a very low maintenance grass. It only needs to be mowed about twice per year, and then only to encourage uniformity. This grass also does not need a lot of water, so you don’t have to worry about sprinklers or watering the grass in the dry months like March. For the most part, you can plant peanut grass and leave it to thrive on its own, with very little assistance from you. 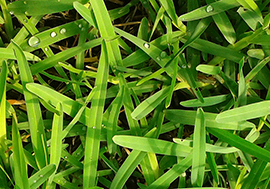 Peanut grass is also a great sod to plant in areas that may get foot traffic. Unlike other types of grass, perennial peanut will not take a long time to recover from depressions in the turf. Footsteps do not linger with peanut grass, and your lawn will continue to look its best regardless of the foot traffic that you get. This makes it a great grass for families with growing children who like to play in the yard. If you are interested in getting perennial peanut for your lawn, contact us today for more information. We offer this and many other sods to make your lawn something you can be proud of.